Women's World Cup 2011: A Quick Guide To The Big Soccer Tournament : The Two-Way The U.S. team is ranked No. 1 in the world, and they won gold in the recent Olympics. But they're not the clear favorite to win World Cup — that would be Germany, which is both the defending champion and the host country. The FIFA Women's World Cup is in full swing in Germany, where the tournament's 16 teams are vying for a spot in the title game, slated for July 17. 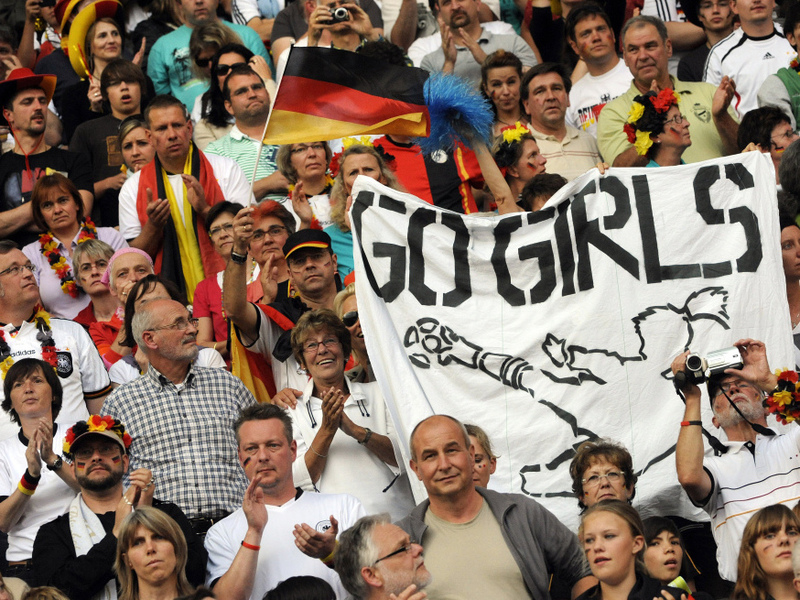 Soccer fans attend the women's World Cup opener between Germany and Canada. In Germany, the game drew a TV audience of more than 18 million, or a quarter of the country's population — better stats than some men's matches garner. Germany and the U.S. have won the Cup twice; Norway has won once. Brazil's best finish is second place (2007). The U.S. last won the tournament in 1999. The U.S. women's soccer team is currently ranked No. 1 in the world, and they won the gold medal in the most recent Olympics. But they're not the clear favorite to win the Cup — in many eyes, that would be Germany, which is both the defending World Cup champion and the host of the 2011 tournament. 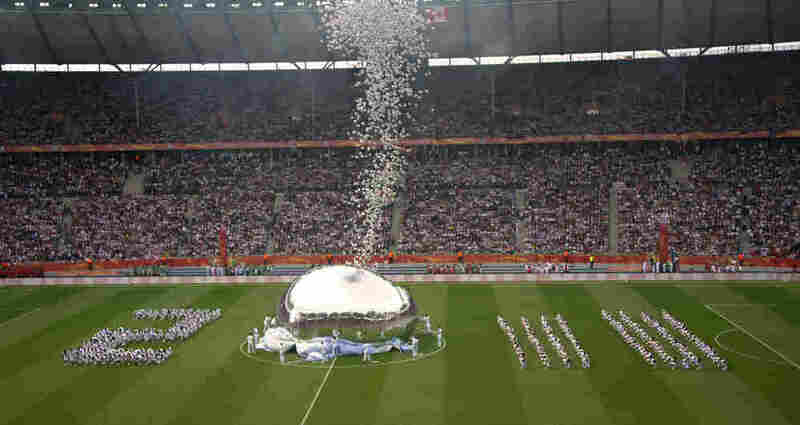 Germany opened play with a 2-1 victory over Canada, playing before a crowd of 73,000 that included Chancellor Angela Merkel. But the U.S. squad came out strong as well, beating North Korea, 2-0. And in an odd turn, the North Korean coach said that the loss may have resulted from some of his players' being struck by lightning before the match. Besides Germany and the U.S., teams expected to contend for the title include Brazil, Japan and England. Squads such as Nigeria, Norway and Australia, may also be in the mix. The most obscure team in the tourney — and thus a team destined to be everyone's favorite underdog — is Equatorial Guinea, which entered the World Cup as the world's No. 61. I'm sure you already knew this, but the coastal country is wedged between Cameroon and Gabon, just north of the equator. The CIA World Factbook puts its population at 668,225. Equatorial Guinea has also come under scrutiny for its players' eligibility. Just before the team's first game, FIFA suspended striker Jade Boho on the grounds that she had played for Spain within the past five years. And as sports analyst Stefan Fatsis told All Things Considered host Robert Siegel, "three of their players have been accused of being men." Since those accusations arose during last year's African championships, two of Equatorial Guinea's players — who said they were sisters — have been left off the World Cup team. A Tricky Bracket For The U.S. The tournament bracket is broken into four groups of four teams, with the United States in Group C, along with North Korea, Sweden, and Colombia. The draw could put the Americans in a tight spot if they don't win the group: The Group C runner-up must face the Group D winner — and Group D contains Brazil. That match could be a stern test for the U.S. team, which, despite its No. 1 ranking was the final team to qualify for the World Cup, thanks to a win over Italy in November. If the U.S. women win Group C and Brazil wins Group D, the Americans would face Norway, winners of the World Cup in 1995. This year, the team is led by forward Emilie Haavi, 19, who goes by the nickname Der Bomber. Sponsored By Jiffy Pop? Football balloons are released during the opening ceremony of the 2011 FIFA women's soccer World Cup, at Berlin's Olympic Stadium on June 26. The second stage begins on July 9, when the top two teams from each group move into the elimination rounds. In all, 30 games are being played in 9 German cities. If you want to catch up on the action, or just to watch some nice goals, there's a video highlight page on the FIFA site. The web videos have stadium sound only — so, there's no announcer shouting GOOOOOOLLLL, or, actually, no announcer at all. To American ears, the comparative silence is jarring: Where, you might wonder, are the whooshing graphics and the nonsensical metaphors? For the most part, ESPN's analysts have been pretty restrained, and the network is investing heavily in its World Cup coverage. Visit their site for video highlights and analysis, much of it focusing on the U.S. team. You can also see all the groups and scheduled matches at the FIFA site.